Triple Frontier is about the brotherly bond between five former Special Forces operatives who find themselves strapped for cash and head to South America for an off-books mission to rob and kill a drug lord. 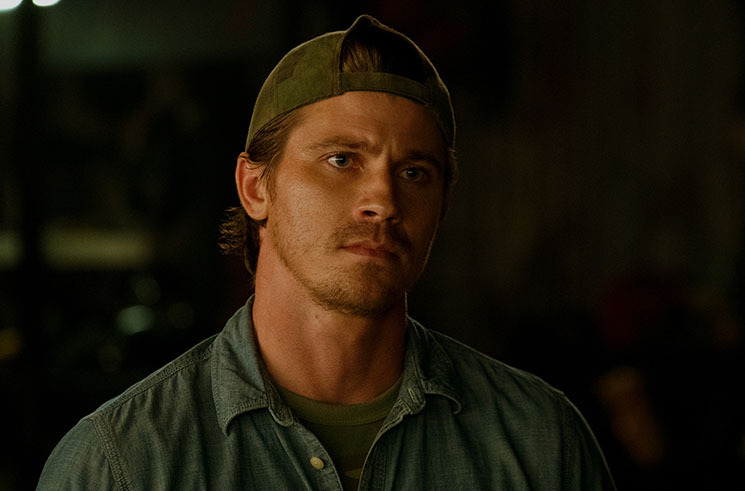 For Garrett Hedlund, this meant reuniting with some of his closest colleagues and real-life friends — and their off-screen bond added a sense of authenticity to their on-screen camaraderie. "Charlie [Hunnam] and I have been best pals for 15 years," Hedlund says. "I've slept on his couch more than I've slept on my own brother's couch." Hedlund explains that he's similarly tight with co-star Oscar Isaac, with whom he previously acted in the 2015 crime thriller Mojave and the 2013 musical dramedy Inside Llewyn Davis. "Oscar had jumped on, this is our third film together and we've been very close for the last ten years," he says. "It was full-circle of guys that we knew would click. When the film is essentially about brotherhood and camaraderie and these guys trying to help each other out and hold each other up — it just came naturally." Directed by J.C. Chandor (A Most Violent Year, All Is Lost), Triple Frontier is much more than just a heist movie. It's also a commentary on the lack of post-service support that soldiers receive after they leave the military, as well as a gripping survival story set in the South American wilderness. With a cast that also includes Ben Affleck and Pedro Pascal, it's an action-packed addition to Netflix's ever-growing catalogue of original content. "We had wonderful military supervisors that brought us all together in Simi Valley in California, doing the weapon work," remembers Hedlund. "We got to tease each other and get competitive. I think there was a brotherly love bond throughout the whole group." It's only fitting that Hedlund has such genuine chemistry with his co-stars — Hunnam plays his older brother in the film, which explains why the characters have each other's backs even when their carefully laid plans go awry. Considering that one of Hedlund's first-ever roles was in 2005's Four Brothers, the role of "younger brother" is familiar territory. "It's very funny," he explains. "When we shot Four Brothers in Toronto, I didn't think that 14 years later I'd still be playing the younger brother. I'm 34 and I'm playing the younger brother." With a chuckle, he adds, "I'm still bringing the youth."